Harsh “chack.” Song is high “koo-a-lee,” sounds like a squeaky door hinge. Description: Yellow eyes; squared tail. Breeding male is shiny black overall; dull metallic green sheen. 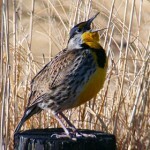 Fall male plumage is broadly tipped with rust; has faint buffy eyebrow and cheek stripe. Adult female is slate-gray overall. Fall female plumage is broadly tipped with rust; broad buffy eyebrow; buffy underparts; and slate-gray rump. Juveniles resemble fall adults but have dark eyes. Habitat: Deciduous woodlands near streams. 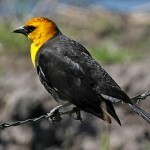 Where in Nebraska: Usually not found in open marshlands, grasslands, and croplands as are other species of blackbirds. Common spring and fall migrant in eastern Nebraska, becoming rarer westwardly. Frequently overwinters. 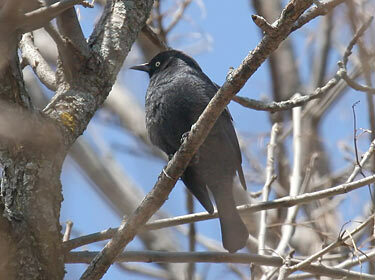 Field Notes: Forms large flocks with other blackbirds during fall and winter, but is not seen in open fields. Fun Facts: The Rusty Blackbird feeds mostly on insects and plant matter, but it sometimes attacks and eats other birds. 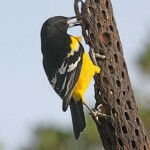 The male feeds the female on the nest.